Spring is an exciting time for pool owners across the nation, but especially for those who live in cold-climate areas and had to close their pools for winter. If you’re one of these owners, you’re probably looking forward to opening your pool for swim season as the weather warms and the ground thaws. 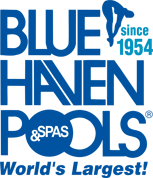 Blue Haven offices have built thousands of pools in cold-weather areas where a detailed process for re-opening winterized pools is needed. For those of you who enjoy a DYI project, here is a step-by-step guide to prepping your pool for swim season. Step 1: Clean and remove your pool’s cover. Always begin the pool-opening process by cleaning off the surface of your cover. This is a crucial step: Proper cleaning ensures that leaves and debris don’t fall into your pool when you remove the cover. If you have a solid pool cover, water from rain or snow may have accumulated on the surface—sometimes stagnating and turning icky brown or green with decomposing plant debris. If so, it’s imperative to pump out this bad water so that it does not dump into your pool water. You can do this using a wet-dry shop vacuum or other pump designed for this purpose. It’s also worth noting that your cover is much easier to clean when it is still stretched across the pool. That’s important because a thorough cleaning will help prevent accumulation of mold and mildew when you store it away. If you have a mesh-style pool cover, you can rinse and remove it without intensive cleaning. However, for an anchor-style cover, you’ll need to take a hose, rinse it off, and—depending on how dirty it is—possibly scrub it down with a soft bristle brush. A warning: Do not use a pressure washer on your pool cover, or you might damage it. Instead, purchase what’s known as a truck wash brush, which comes with a long fiberglass stick and soft bristles. You can find one at many auto supply stores or online. After thoroughly cleaning and removing your pool’s cover, lay it out in the yard to fully dry. You can then carefully fold it up and place it in dry, clean storage area. Step 2: Unplug, recap, and replace plugs and fittings. The next step in opening your pool assumes it’s been effectively winterized. (For more on winterizing your pool, visit http://articles.bluehaven.com/how-to-winterize-inground-pools). If you have winterized your pool, the return lines (the lines that go out from your pool’s equipment to the pool) will have been blown out to remove water, and capped. In some regions of the country, the skimmer line will have been filled with antifreeze to prevent freezing and mildew. In addition, an ice compensator (such as a gizmo or freeze plug) may have been inserted into your pool’s skimmer. To reverse this process, begin by walking around your pool and removing the winterizing plugs from return lines and the ice compensator from the skimmer. If antifreeze was added to your skimmer for winterization: Begin the process of evacuating it. If you have a DE or sand filter, turn the handle of your multiport valve to “waste.” This will push all of the antifreeze to the waste line as the pump runs. For a cartridge filter, simply use a wet-dry shop vacuum on the skimmer line to pull out the antifreeze. Any remnants will be flushed after you turn on the pool pump. Next, replace the return fittings, and reinstall all of the pump and filter plugs that were removed for winterization. Expert tip: If you didn’t winterize your pool yourself, you may find that the service technician placed these parts inside the pump basket. Step 3: Refill your pool. After ensuring that the skimmer line is flushed, winterizing plugs and ice compensator are removed and return fittings and pump and filter plugs are reinstalled, you can then move to the next step: Refilling your pool! To be clear: Your pool should remain filled for winterization, but the water level should have been lowered to just below the skimmer. Over the winter, the water level may naturally drop even lower due to evaporation. It is vital to return the water level to halfway up your skimmer. You can do this with a garden hose before moving to the next step. Step 4: Check your filter and prime your pump. Now that your pool lines are operational and your pool water is back up to operating level, you’re ready to prime your pump and start it! Next, check the pump O-ring for cracking. If cracking is present, the O-ring will need to be replaced. If you do purchase a new one, you’ll first have to lubricate it (and the threads on your pump lid) with a silicone-based lubricant, before replacing it on the pump. Once the O-ring is secure, fill your pump’s pot with water from a garden hose, and replace the lid. Now you can turn on the pump. Once it’s running, make sure to check through the lid of your pump for circulating water. In addition, you’ll want to check the pressure on your filter pressure gauge. If you do not see movement in the water or pressure on the gauge, you may have a suction leak. If so, tighten the pump's union/pipe connections, and inspect suction valves for any leaks; loose connections or leaks will allow air to enter the system, resulting in a pump that won't prime. Clogged or leaking suction lines will require a call to a service technician. Step 5: Clean the water and balance pool chemicals. Balancing the chemicals in your pool is critical to the health and safety of everyone who will use it. For most pool owners, the easiest method of approach is to bring a quart of pool water to a local pool supply store to have the water chemistry checked. They will also have plenty of options for you to buy chemicals to properly treat your pool water. Frequently, these shops also sell special “pool-opening chemical kits”. Shock your pool using the process outlined in this YouTube video. Adjust your water’s alkalinity to between 80 - 120, using your test kit as a reference. After alkalinity is in proper range, measure the pH using your test kit to ensure that it falls between 7.4 and 7.6. Many pool owners are comfortable reopening their own pools, but it’s never a bad idea to get expert help. The multi-step process required to open your pool after winter can be somewhat laborious, and it is critically important to make sure your pool is clean and safe for everyone to use. Reach out to a service technician about scheduling a pool opening, or call your local Blue Haven office to see if they offer pool opening services.